Ma'ono is located in West Seattle and was formerly called Spring Hill which I blogged about previously. Spring Hill was known for their famous Monday night fried chicken dinners which I enjoyed with friends back in 2010. It appears the fried chicken was so popular that they decided to rename the restaurant Ma'ono Fried Chicken in Feb of 2012. 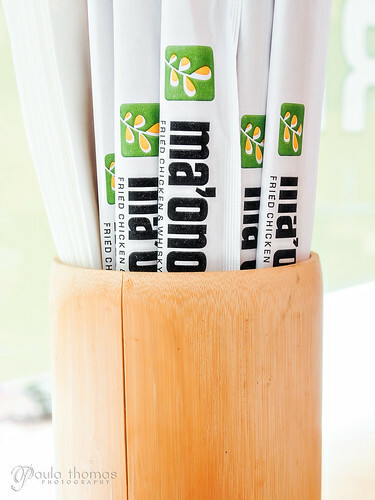 Ma'ono, a Hawaiian word, means to make flavor/delicious. If you enjoyed Spring Hill's fried chicken you'll be happy to know that the recipe is still the same however they use soybean oil now instead of peanut oil. While checking out their dinner menu, I discovered they also offer a gluten free version of the fried chicken that I really want to try some time. They use Bob's Red Mill gf flour for the batter and have a separate fryer so there is no cross contamination of gluten. They ask that you call 24 hours in advance if you want the gluten free chicken so they can have it prepped and ready for you. Mark and I attended a photostroll in West Seattle with the Seattle Flickr group last Saturday afternoon and decided to have brunch at Ma'ono since we haven't been there since the name change and wanted to check it out. In case you can't tell from the new name, they now offer their fried chicken every day of the week. They have a special brunch menu on Sat/Sun from 10-2. We arrived just before noon and got a great seat in front of the window so there was good light for picture taking. They offer several items on the brunch menu that aren't available any other time. We spent a long time looking at the menu trying to decide what to order. 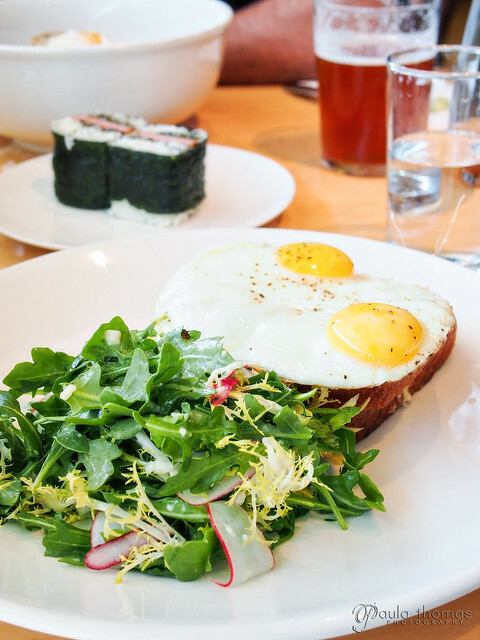 We finally decided on two brunch only items, the croque madame and the loco moco. Mark also insisted on trying the spam musubi which is also available on the dinner menu. I didn't do any research or review reading before going so I wasn't sure what to expect with these choices but they sounded good from the menu. 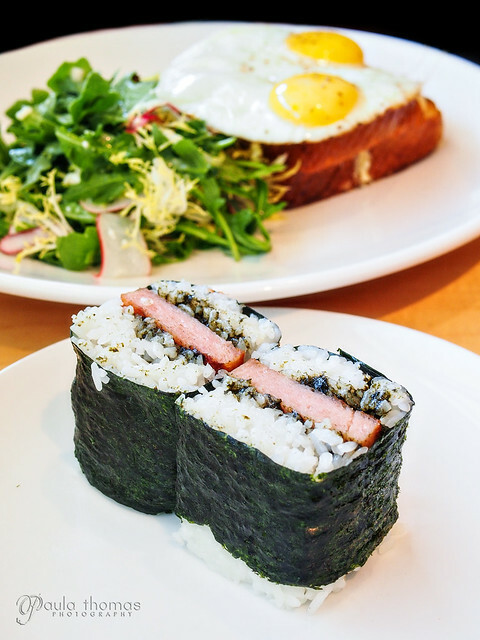 The spam musubi arrived followed quickly by the croque and loco moco. We had no idea what a croque was so when it arrived it wasn't what we had pictured. If you don't know, it basically looked like a grilled cheese ham sandwich with over easy eggs on top. Being that I am eating mostly gluten free these days I only had one bite of it but it was good. 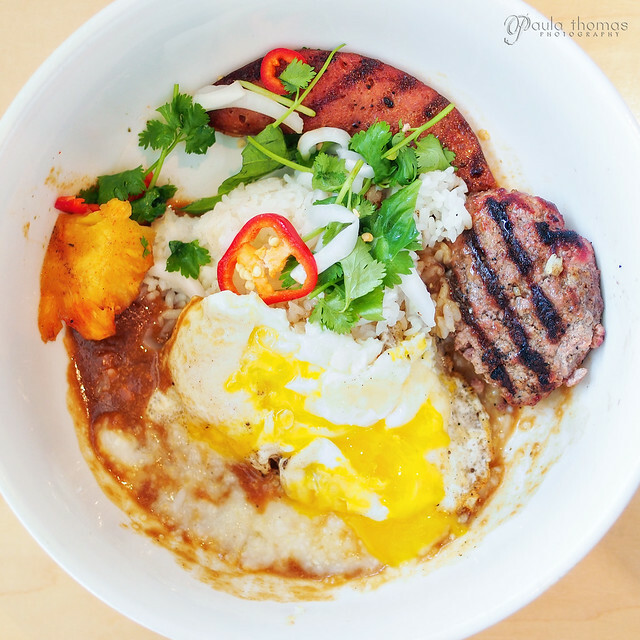 The loco moco was more my kind of meal. I like variety and you can't get much more variety than this dish. There was so much stuff in the bowl I wasn't even sure what some of it was. The menu listed Wood grilled chuck, Portuguese sausage, brown gravy, rice and grilled pineapple in the dish but there was more than just that. There were some garnishes of cilantro, sliced red peppers and something white that was grated maybe coconut though it seemed more soft so I have no idea what it was. There was also some kind of porridge, maybe grits on the bottom of the bowl. I enjoyed every element of the dish but I thought the grilled pineapple could have been sliced more thinly. It was a little difficult to eat since it was cut in such a large chunk. I would definitely order it again but only after I try the gluten free fried chicken!